I need help with a couple things. I have created a macro to go into a webpage and download a table and create an excel file. Easy enough. When the table has a small amount of information it puts all of the information into one cell as one long string. This is ok because I have created a VBA script to split the text and format it how I want. The problem I am having is that when I download the table and it has a lot of information for a whole month it will put the first half of the report all into one cell and then the second half goes into individual rows. The macro I have created can't work with both formats. Is there something I can do when I extract to either have it all go into one cell or have them all go into individual rows but not both? But the general Idea would be to "manipulate" the Content of '!EXTRACT' directly using 'EVAL()' (and not with 'ADD' or the "automatic" Extract Mechanism) to include/reorganize specific Content or modify its Structure before doing the 'SAVEAS'. Here is the script I am using. The website to get the information is a website that I need to use login credentials for, do you need to actually visit the site? Here is my code. I have tried change the Extract type to BODY, or TABLE but I get the same result. senor pengwin wrote: Here is the script I am using. The website to get the information is a website that I need to use login credentials for, do you need to actually visit the site? I tried this but it didnt work, it just put "" in the cell and the rest of the data went underneath. I will attach the full code with login and pw. You dont have privileges to make any changes but I would like to take the login info down once you have been able to get to the report. Thanks for your help. Last edited by senor pengwin on Sat Aug 19, 2017 1:43 am, edited 1 time in total. So I'm thinking the issue is that there are too many characters in the string. It's over 32,500 characters and I'm pretty sure that's close to the limit for a cell so the rest of the information gets separated. What can I do in this case? I've tried using the EVAL() function and tried to split the info, shown below, but it didnt work :/ Any Suggestions? senor pengwin wrote: I tried this but it didnt work, it just put "" in the cell and the rest of the data went underneath. I will attach the full code with login and pw. You dont have privileges to make any changes but I would like to take the login info down once you have been able to get to the report. Thanks for your help. senor pengwin wrote: So I'm thinking the issue is that there are too many characters in the string. It's over 32,500 characters and I'm pretty sure that's close to the limit for a cell so the rest of the information gets separated. What can I do in this case? I've tried using the EVAL() function and tried to split the info, shown below, but it didnt work :/ Any Suggestions? Last edited by senor pengwin on Sat Aug 19, 2017 1:42 am, edited 1 time in total. OK, so I've been busy for quite a few hours having "fun" [sic...!] with your Report today, ah-ah...! OK, "we" are hitting quite a few Limitations in this "Case", ah-ah...! But first, hum..., I saw on the previous Page, next to the 'Create Report' that you had a 'Save Report' Button, I didn't check it (yet) content-wise, but isn't it actually more or less what you want...? 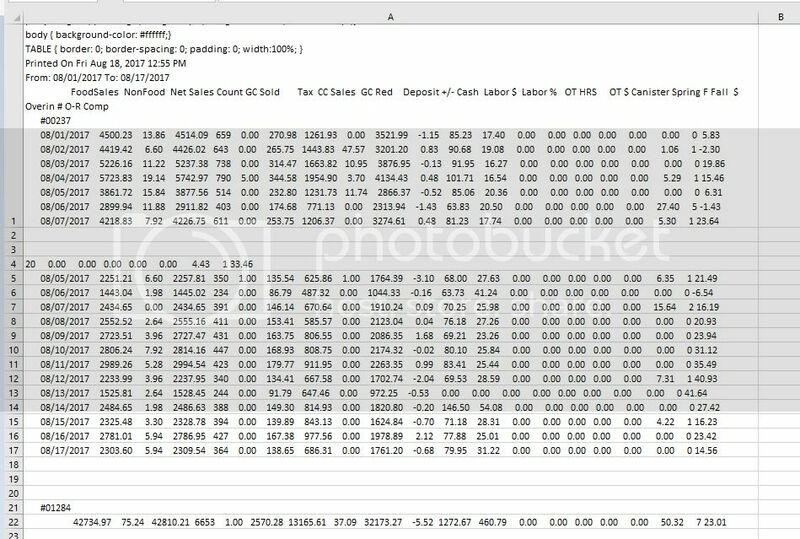 The Report is presented on the Page in a 'FRAME' (F=3="wrapper_main"), that's OK, and this Frame contains a "main" 'TABLE' that contains all the Data, from "EYMKING - Control Cash Summary" on the first Line/Row till "MICHIGAN <=> 1573571.48 3235.98 1576807.46 22450 141.00 94639.78 483347.24 3151.79 1191161.04 6071.83 38566.54 12235.50 312.03 4512.36 0.00 0.00 0.00 4630.43 485 5.96 <=> Page: 1/1" for the last 3 Lines/Rows, about 600 Rows further, at the end of the Page/Frame/Table. That's "OK" as well, and iMacros has a Mechanism to extract a whole Table with just one 'TAG'+'EXTRACT' Statement, except that the Table on this Site that contains the whole Data I referred to in only ONE Cell ('TD' HTML Element)...! But iMacros expects a 'TABLE' to be made of Rows ('TR') + Cells ('TD') within a same Row, not one single Cell...! So iMacros can extract 'TABLE''s in one Statement, or it can extract at the 'DIV' or 'SPAN' Level..., but for 'DIV' (= each Line/Row in the Report), that means looping a Script 600 times, and probably about 1000 Rows => times at the end of a month. OK, I gave it a try, and it takes about 30 Sec to extract 100 Lines/Rows at the 'DIV' Level (=> 3 Min for 600 Rows, 5 Min for 1000 Rows at the end of a month), but then, yep...!, you get the Data of the Report displayed in Excel in one Col with 600 Rows. Last edited by senor pengwin on Sat Aug 19, 2017 11:59 pm, edited 1 time in total.